Taking an interdisciplinary approach, Page casts light on the role of citizenship, immigration, and transnational mobility in Caribbean migrant and diaspora fiction. 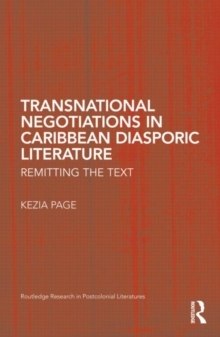 Page's historical, socio-cultural study responds to the general trend in migration discourse that presents the Caribbean experience as unidirectional and uniform across the geographical spaces of home and diaspora. She argues that engaging the Caribbean diaspora and the massive waves of migration from the region that have punctuated its history, involves not only understanding communities in host countries and the conflicted identities of second generation subjectivities, but also interpreting how these communities interrelate with and affect communities at home. In particular, Page examines two socio-economic and political practices, remittance and deportation, exploring how they function as tropes in migrant literature, and as ways of theorizing such literature.